MK Sharon Gal touts Yisrael Beytenu deal with Likud, says closer cooperation with the coalition expected. A day after Yisrael Beytenu struck a highly publicized deal with Likud, MK Sharon Gal (Yisrael Beytenu) announced the Knesset could expect increasingly closer cooperation between his party and the coalition. "Cooperation is not a dirty word," the freshman MK asserted to Army Radio. "Finally, here are practical politics, based on values, which doesn't make small accounts and has the benefit of the country on its mind." "We have nothing in common with the left-wing opposition," Gal stressed. "What is there between us and [Meretz chairwoman] Zehava Galon?" 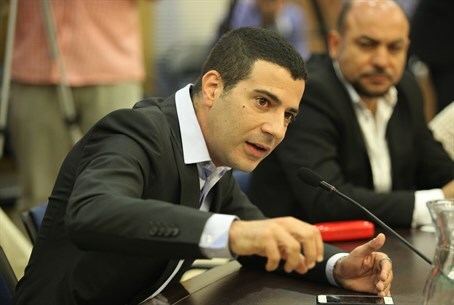 Gal expressed support for the deal with Likud, emphasizing Yisrael Beytenu would keep up its end of the bargain and advance Likud MK Nurit Koren as a nominee to the Judicial Selection Committee. "We are people who stand behind agreements, and when there is an opportunity to influence, especially to have people more on the Right end of the spectrum appointing judges, we are simply happy about it." Gal then addressed new legislation he is promoting, calling for the death penalty for terrorists; the bill will go before a Ministerial Committee for Legislation vote on Sunday. "Life imprisonment is costing us a lot of money and ends after three years when there are agreements releasing terrorists," Gal argued. The lack of a death penalty for terrorists, he continued, "endangers the lives of Israeli in the State of Israel."